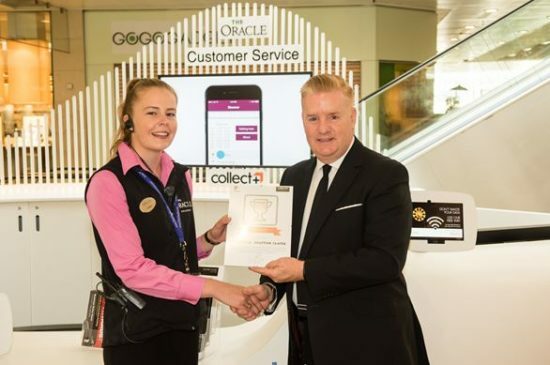 The Oracle in the centre of Reading has offered shoppers the CollectPlus service since late 2015, and has now been awarded the prestigious CollectPlus ‘Store of the Quarter’ award. This recognises its achievement as the best store in the CollectPlus network, scoring an impressive 4.85 out of 5 stars for the period April to June 2016. A. The Oracle is the largest shopping centre in Reading and houses over 80 stores as well as many restaurants, cafes, bars and an eleven screen Vue cinema. The CollectPlus service is located at our Customer Service Desk and is staffed throughout the day by our dedicated Customer Service team. This is very convenient for shoppers, as they can visit us to drop off or collect parcels throughout the day – allowing them to tick off several things on their to-do list in one go! The Customer Service Desk also offers gift card purchases, taxi and hotel bookings and a full range of assisted shopping and Shopmobility services. We joined the CollectPlus network to provide an additional service to our customers, and it’s been very well received and has contributed towards an increase in footfall to the centre. It’s also proven to be useful for our retailers, as they can offer the Click & Collect option to customers shopping online if something is not in stock. Q. There are over 5,800 newsagents, convenience stores and petrol stations in the CollectPlus network, so how does it feel to have been named the UK’s best CollectPlus location? A. We have a team of seven who work between the Customer Service Desk and our Shopmobility service, and the whole team is very pleased to win the CollectPlus ‘Store of the Quarter’ award, especially given that this has been our first full quarter offering CollectPlus. Our customers are really pleased to find the service here, and its a great validation for the team especially as the award is based on positive feedback from customers. A. We want to continue to let people know about the service, promoting it in the centre and through our retailers, and we’re hoping to beat our customer satisfaction score in the next quarter!